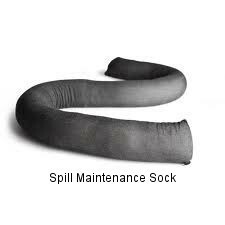 Absorbs all kinds of industrial liquids, oil or water based. 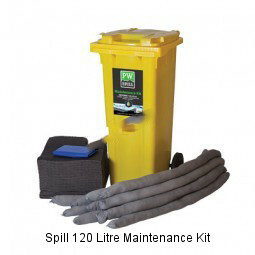 An economical kit packed in a yellow 2-wheeled industrial strength polyethylene bin. This is ideal for moving to the point of the spill. Black maintenence pads have coverstocks that hold the pads together even when saturated. THe kit contains 110 pads, 10 socks and 10 bags with ties. Knitted outer skin with fast absorbency speeds. It absorbs more than 4 litres of water and oil based liquids. The maintenance roll is a workshop favourite, easily dispensed and ideal for walkways, with open edges for quick wicking. A full roll has the capacity to absorb 80 litres of water and oil based liquids. These pads have open edges for quick wicking. High strength spun bond coverstocks prevent lint sticking to machine parts and hold the pads together even when saturated. Each pad absorbs 0.8 litres.